An exciting South African Big Five Safari can be enjoyed at Welgevonden Game Reserve in Limpopo, that feature modern facilities and exposes guests to the rugged bushveld. 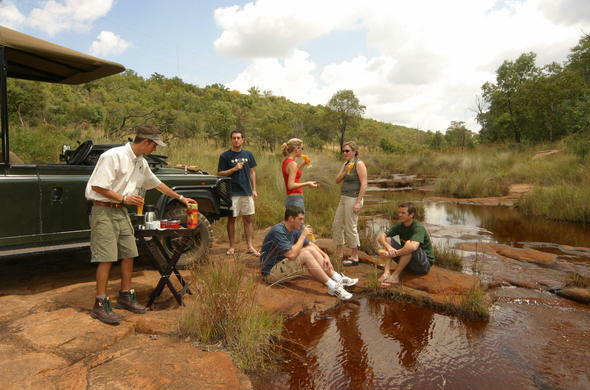 At Welgevonden Game Reserve, guests enjoy professional and informative game drives on a South African Big Five Safari in the Waterberg. Along with your professional game guide, track an abundance of wildlife in specialised game vehicles. Game drives are conducted twice daily, when the free roaming fauna are at their most productive. The Welgenvonden Game Reserve has a profusion of 300 different bird species which can be seen on safari and on the premises of the lodge. Guests can experience fine dining and savour sumptuous South African dishes at the restaurant. The dishes served at this Welgevonden lodge accommodation infuses African and Western flavours to tickle refined palates. The restaurant has a fine selection of wine to pair with your delicious meal. Enjoy unique and productive brainstorming and private meetings in the 16-seat boardroom. The lodge has state-of-the-art equipment and facilities including a data projector, internet connection, flip chart, conference stationary and water stations for conference delegates. Therapeutic spa treatments massages can be enjoyed during your leisure time. Choose from array of specialised treatments to soothe your body, mind and spirit.